So it’s been dawning on me lately that I’ve really wanted a proper hamburger. Yeah, you can make those ultra thin buns with a whoppie pan, or you can even make a cupcake bun and cut it in half – but it’s just not the same. Plus, you have to do so much work just for a few buns. I wanted something that I could throw together in a sinch and not have to worry about cleaning up, baking times, or any of that other stuff. 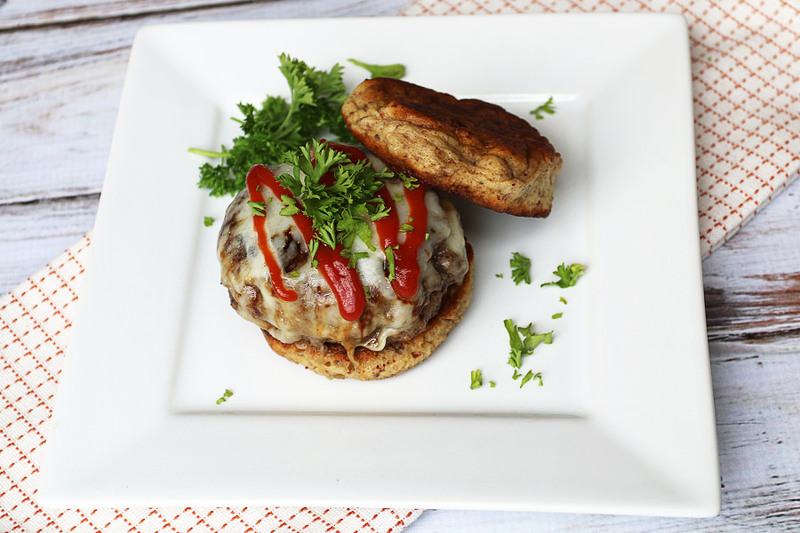 Luckily, I’ve come up with a pretty good solution – hamburger mug bun, anyone? The bun itself is a bit odd tasting (from the psyllium husk would be my guess). It pairs VERY well with beef, in my opinion, and I don’t really need to add any extra spices or flavorings to it. But, if you’re the type that needs to disguise the flavor, feel free to add your favorite spices to mask the flavors – cumin, oregano, paprika, even curry! This is one of the few times that I say that the type of almond flour you use doesn’t matter. 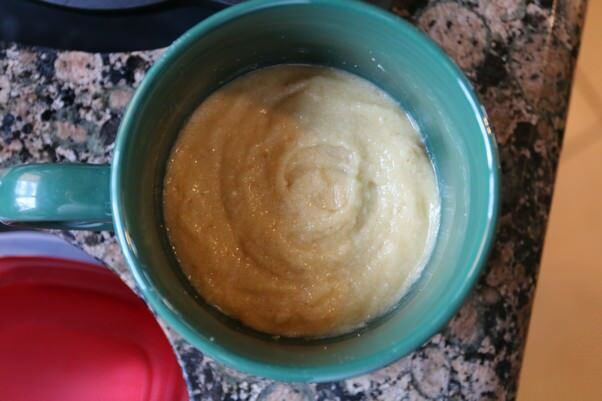 I’ve done this with both almond meal and blanched fine grain almond flour. Both turn out just fine. The only thing that’s really affected is the color. The almond meal (non-blanched) is going to give you a darker bun, similar to that of a whole wheat bun. 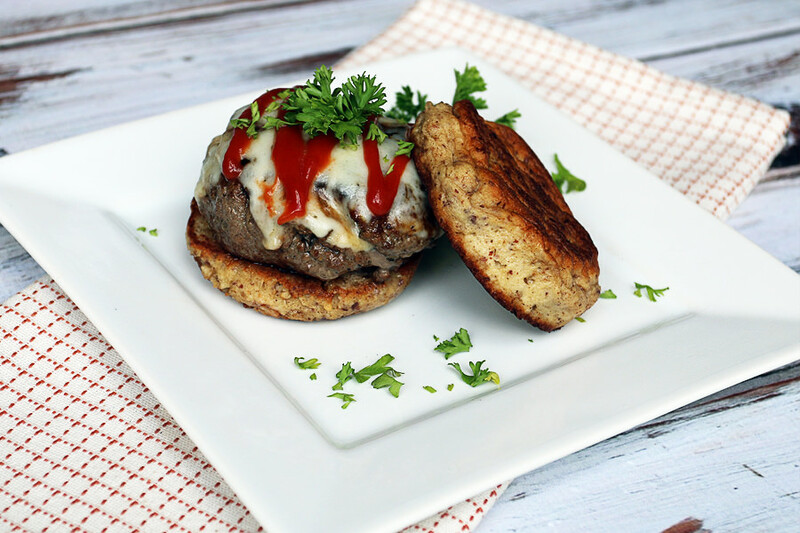 The blanched almond flour will give you a lighter color bun, similar to a typical hamburger bun. The mug is the most important thing to keep in mind here. You want something that’s actually large enough for a hamburger bun, so you want a mug that’s pretty wide. Whenever I make my buns, I always have a go-to mug that’s very wide and short – similar to a cappuccino cup. Making sure you select the correct mug for the job is crucial, as it will shape the bread at the end. If you choose a normal sized mug you will have a much thicker bun, but it will be much smaller in diameter. 1. 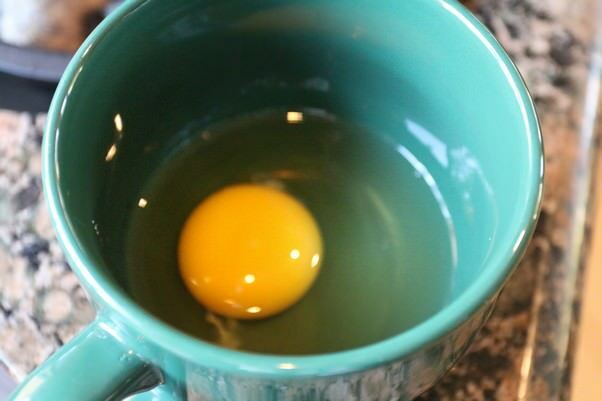 Crack an egg into a mug. Make sure that your mug is wide, unlike the conventional mugs. 2. Microwave butter for 10-15 seconds to melt. Once melted, pour over the egg and mix well. You want some aeration to be done, so the eggs should turn a bit lighter in color. 3. Add 1 tbsp. Almond Flour, 1 tbsp. Psyllium Husk Powder, 1/4 tsp. Baking Powder, 1/4 tsp. Cream of Tartar, and 1 tbsp. Chicken Broth. 4. 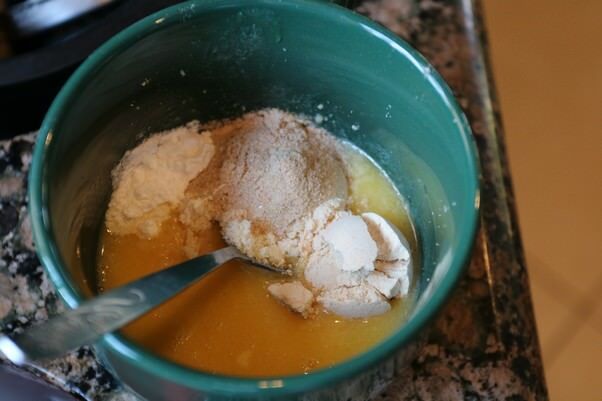 Mix everything together well until a slightly doughy substance is formed. Make sure you wipe the edges of the cup where excess dough might be stuck. You want to try to make the top uniform. 5. Microwave for 60-75 seconds depending on the wattage of your microwave. You will notice that if puffs up quickly – don’t worry, it will reduce greatly in size once you take it out. Once out, turn over the mug and lighly tap it against a plate. Cut the bun in half and sauté it in butter. 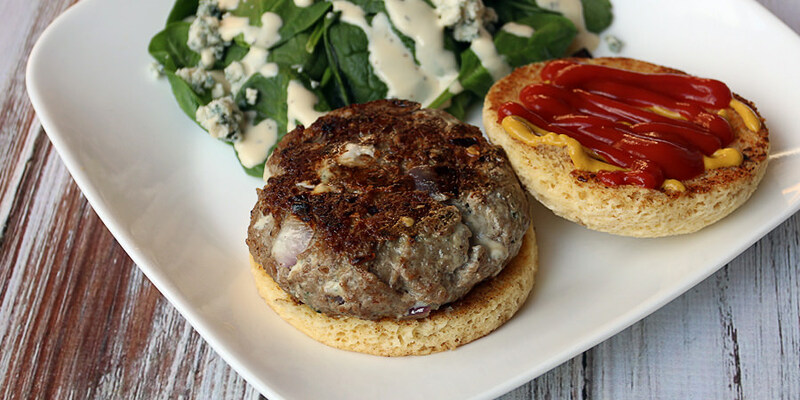 This makes 1 Microwave Hamburger Bun, which comes out to 248 Calories, 19.77g Fats, 3.01g Net carbs, and 7.99g Protein. 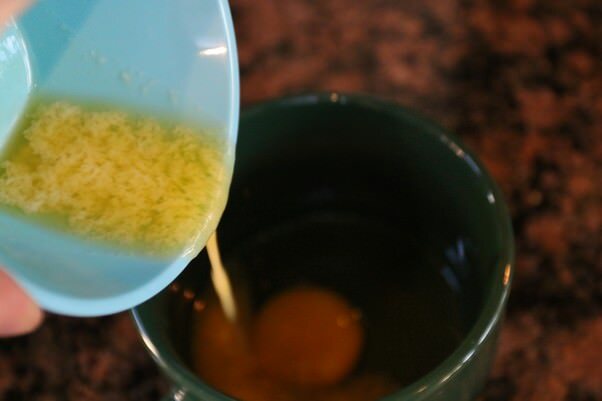 Crack an egg into a mug and pour in the melted butter. Stir together well until eggs are lighter in color. Add the rest of the ingredients and mix well. You should end up with a slightly doughy substance. Microwave for 60-75 seconds, depending on wattage of microwave (it will puff up in the mug, and reduce greatly in size on you take it out). Slice in half and sauté in butter.